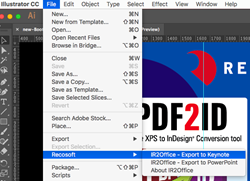 Recosoft Corporation the creators of PDF conversion software and workflow automation plug-ins for Adobe® InDesign® has shipped IR2Office 2018. IR2Office is a new tool to convert Adobe Illustrator® files to Microsoft® PowerPoint® and Apple® Keynote® formats. IR2Office is a plug-in for Adobe Illustrator which converts Illustrator (.ai) files to the Microsoft PowerPoint and Apple Keynote formats while maintaining layout accuracy. IR2Office converts the text, associated fonts, vector graphics and images along with the corresponding property information to the equivalent Microsoft PowerPoint or Apple Keynote data and property; converting every artboard to an equivalent slide in the final PowerPoint or Keynote document type. IR2Office saves you valuable time in recreating Illustrator content in PowerPoint and Keynote as the Illustrator data and layout structure are maintained. IR2Office has been designed to provide seamless integration with Adobe Illustrator eliminating the necessity to acquire and install additional tools; resulting in enhanced workflow automation and providing huge cost savings in both time and expense. IR2Office operates as a plug-in for Adobe Illustrator enabling you to directly convert Illustrator CC 2015 or higher documents to the target format. IR2Office converts the Illustrator file to the Microsoft PowerPoint or Apple Keynote type. IR2Office maintains the layout of the document when converted to the PowerPoint or Keynote type. Text, Vector Graphics, Images, Gradients and other object property information are converted appropriately. Simply open up the Illustrator file to export to PowerPoint or Keynote type and choose the Export to Keynote or Export to PowerPoint command. IR2Office converts all artboards in the Illustrator file to a corresponding slide in the resulting PowerPoint or Keynote file type. IR2Office, ID2Office, PDF2Office, PDF2ID, PDFtoID are trademarks or registered trademarks of Recosoft Corporation in the US and/or other countries. Microsoft, Excel, PowerPoint, Word and the Office logo are trademarks or registered trademarks of Microsoft Corporation in the US and/or other countries. Adobe, Illustrator, InDesign and Creative Cloud are either registered trademarks or trademarks of Adobe System Incorporated in the US and/or other countries. Apple, Macintosh, macOS, Mac, Numbers, Keynote, Pages, iWork, iPod, iPhone, iOS, iPAD are either trademarks or registered trademarks of Apple, Inc. in the US and or other countries. All other trademarks are recognized and are the property of their respective owners.